This is a delicious and highly nutritious soup which was designed for the cleansing and nourishing of kidneys. When juice fasting/feasting, I like to include something hot and savory in my menu for a change. I like to make this special vegetable soup that is highly nutritious and very healing. This soup is always served as a starter soup when doing Gerson Therapy (for cancer patients), helps cleanse the kidneys, repair damaged cells and nourish them back to health. In fact, a small amount of cooked foods (or soups in this case) is necessary when consuming a raw diet. 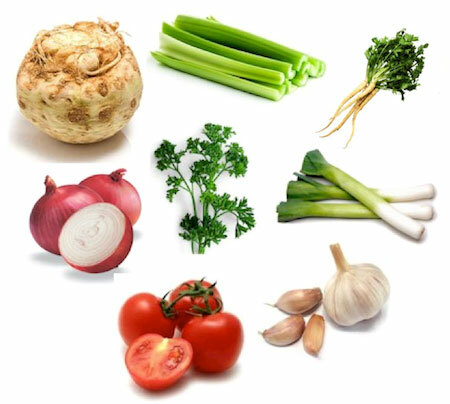 It provides soft fiber/bulk which helps with the digestion of the raw foods/juices. It also “softens the raw-ness” in the stomach, helping to ease the digestive system for better absorption of the huge amount of raw diet. Wash and scrub the vegetables well with a vegetable brush. To preserve as much of the nutrients as possible, use a slow cooker if you have, or small fire over the stove. Cook this recipe in slow and low heat until cooked (about 2 hours). Fast and high heat cooking causes the cells to break and disrupt the colloidal composition, making it less bioavailable. Minerals and phytonutrients don’t get destroyed in heat and will leach into the soup. This portion serves four. If not on Gerson Therapy, you may substitute these ingredients with anything that you fancy. Fill pure drinking water in the pot just enough to cover all the vegetables. Bring to a boil; then, set to low fire whether you’re using a slow cooker or cooking over a stove. Cover pot to keep the steam in. Simmer for about 2 hours or until vegetables turn soft. Once cooked, run the cooked vegetables through a food mill/processor. A gear juicer works well for this function, using the “mincing” screen. Otherwise, use a blender and blend till you get a smooth consistency. Do this while the soup is warm, NOT when it’s hot or cold. You may include the garlic in cooking, or squeeze in the garlic after all these steps if you prefer.